Ryan D: Maybe you were one of those people, like I was, who trudged through all six seasons of the TV series LOST, debating what was really going on underneath the framework narrative, listening to countless fan theories and devising your own. Perhaps the most popular of these theories was that the characters in the show were all in Purgatory, which show-runners Damon Lindelof and Carlton Cuse refuted until they were blue in the face. The tricky thing about fan theories, though, is that when the finale of the series did include a narrative reveal revolving around a state of limbo, many audience members felt disappointed and off-put. They had assumed and hoped that the creators would have devised a finish more surprising than what every Joe and Jill had guessed back in season one, and that the clues given to support this ending were feints and decoys, not the actual resolution. In a similar way, the creative team of Kill or Be Killed, in its tenth issue, confronts the fan theory which has been on everyone’s mind since the first issue: the demonic force which serves as a catalyst for Dylan’s violent turn might by a by-product of a mental condition. 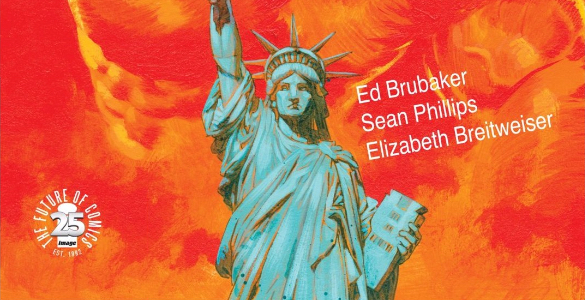 While some readers might be anxious about exploring the most obvious of possible explanations of Dylan’s actions, the deftness of writer Ed Brubaker and his visual team of Sean Phillips and Elizabeth Breitweiser keeps this pseudo-reveal exciting and the narrative fascinating. The caption boxes make it crystal clear that the cops with whom Lily works are more eager to look like genius detectives rather than listen to Lily’s astute application of Occam’s Razor, which brings her closest to the truth of the case. These other cops, then, end up acting like caricatures of police officers, and I appreciate how Phillips “sends up” the visuals on these cops. One plays the cliche of the nerd-cop, bespectacled nose always writing in his notepad, searching for the more academic or psychologically complex solution — a turtle of a man. The other leers across the page at us, chain-smoking, talking big and gesticulating bigger. In the next page, we see that cop approach a desk with his arms wildly articulated and his chin jutting up in a manner reminiscent of a Pantalone in Commedia dell’Arte. This works well to highlight the buffoonery within the NYPD and further reinforce the stifled competence of Lily as a character; structurally, this also allows Dylan more time to complete his unfinished business with the Russian mafia before the police (read: Lily) close in on him in the last act of this series. Every issue reminds me that this Phillips guy knows what he’s doing. The establishing shot shows the concerned mother appraising the mental state of her son from the kitchen, and as the conversation goes on, we see the mom and son talking, but separated by the door frame. Dylan gets up from his seat and takes steps toward his mother, trying to be as forthcoming as he can in his convoluted and dark situation, but can only open up so much. His mother, then, is the one who can cross the threshold into an intimate physical space to give her support, and ultimately give her son a hug. Keeping in mind that this whole scene, with the same dialogue, could have occurred with the two sitting at the dinner table with the moment of physical contact coming from hands touching reassuringly across the table, we instead see a much stronger physical journey which speaks clearly about the characters’ relationships and emotional states. 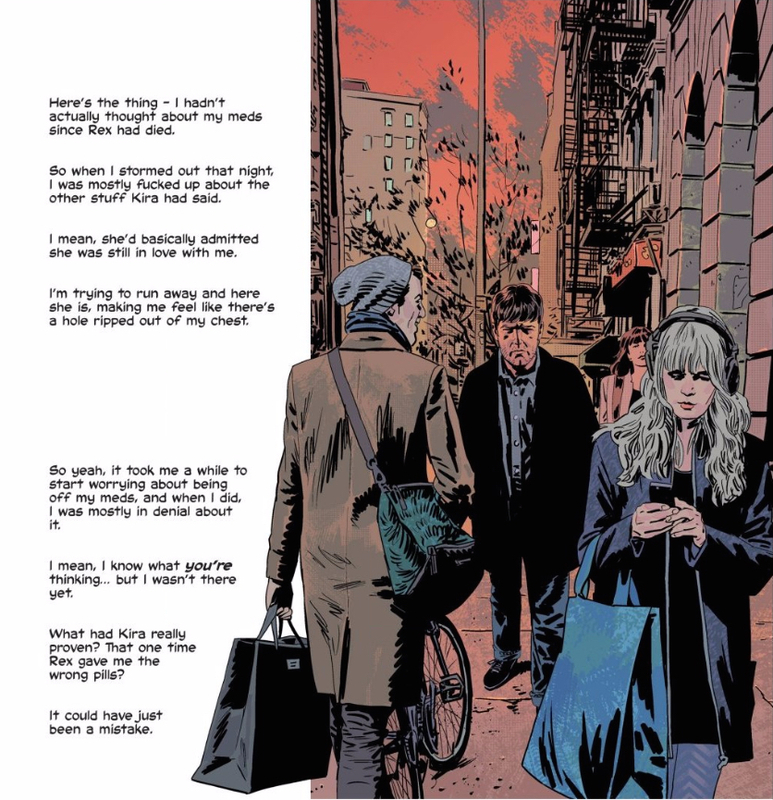 There’s so much more I could say about the visual minutia in this issue which really make it sing, such as Breitweiser’s use of shadows on Dylan’s face when he’s at home, or her ability to pair with Phillips to beautifully light the conversation between Dylan and Kira in his apartment, or their ability to do so much visual commentary with nothing but Dylan’s stark white or blacker-than-black t-shirts, and these may seem like tiny details, but (pun warning) the devil’s in the details with the art here. Drew, sorry about that pun. I’m curious as to your thoughts on the metacognitive (would you use that word?) 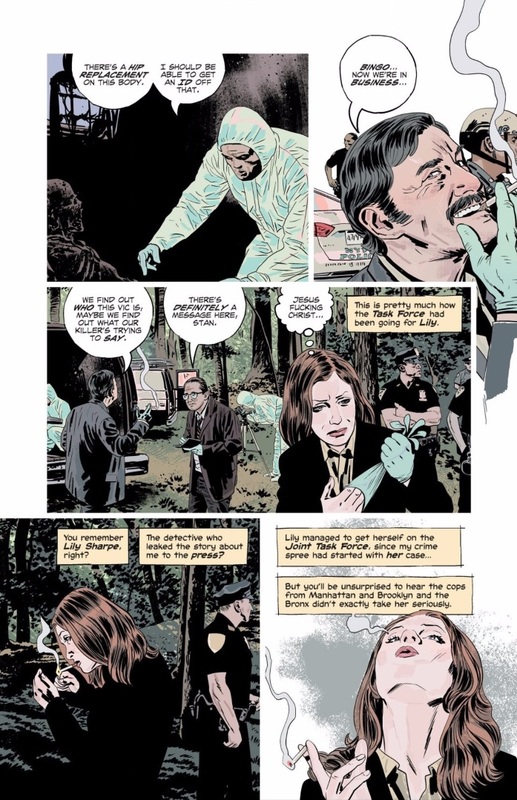 nature of the narration in this issue; it’s been a feature of the series, but I felt like Brubaker really turned up the volume on it as this arc closes and the next begins. Also, would you kindly help me justify my opening paragraph by talking about how this issue moves Dylan’s actions further down the pathway from “sick pact” with a demon, to righteous mission, and now to possibly (canon) mental health issues, which addresses a theory we’ve been flirting with for ages? Drew: I think to answer that last question, we have to dig into the nature of the narration. Throughout this series, Dylan has referred to events he wasn’t present for, and our understanding is that he only learned about those events later. Indeed, we actually saw that learning in action in the previous issue, as Dylan learned all about Bogdan’s slow, procedural manhunt. Those were story beats we’d been getting for several issues, and we finally saw where Dylan got that information. So we have to understand that everything that Dylan isn’t aware of in this series will eventually be revealed to him. 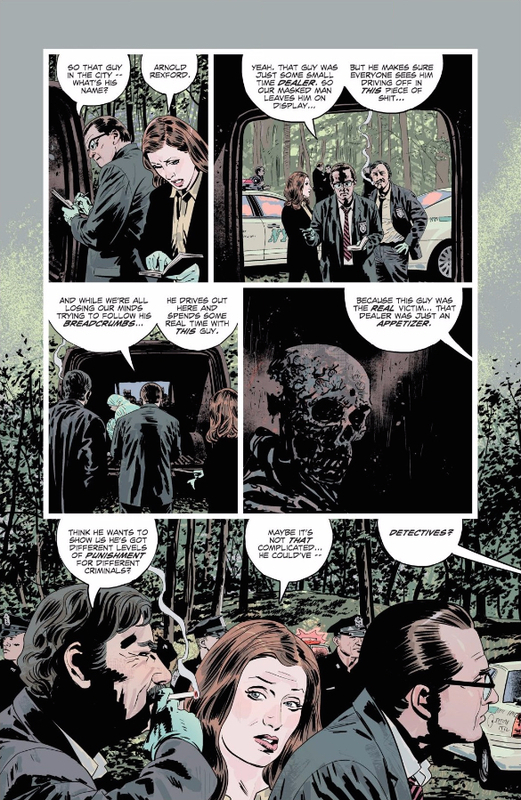 Sometimes, it’s a smaller detail that Brubaker can almost shrug off — like Dylan learning about Kira hiding in his closet — but others, like Dylan’s knowledge of Lily Sharpe’s investigation, suggest a big, life-altering confrontation down the line. So I guess the thing to really pay attention to isn’t what Dylan knows (we kind of already know he’s narrating from a future where he knows the details of Lily’s investigation, presumably because he was apprehended), but that he’s cogent. 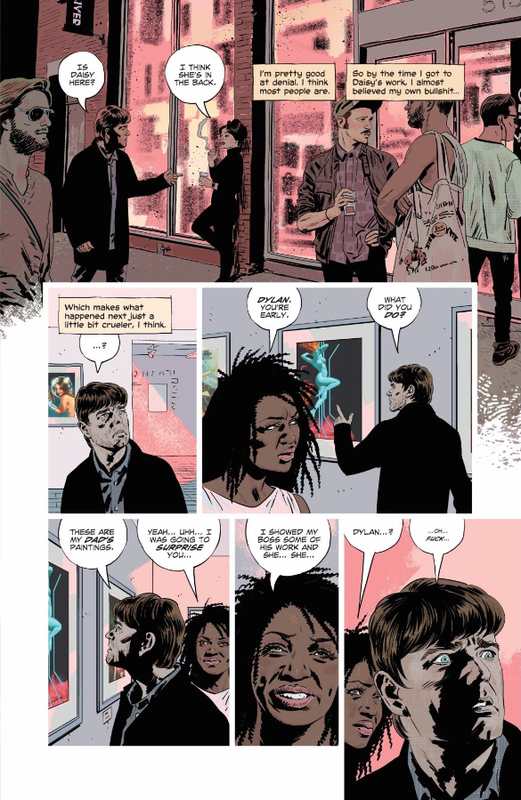 Where earlier issues have been coy on the hallucination vs. demon issue, this one treats Dylan’s awareness of his own psychoses as a kind of inevitable conclusion. Check out the language Dylan uses to refer to his mental state. He talks about denial in the past tense, and anticipates our conclusion, telling us he “wasn’t there yet” (emphasis mine). His insistence in this moment that his meds have nothing to do with his demons are contrasted by his apparent future realization that they absolutely do. And Brubaker tightens the noose — rather than hinting at this reveal for months, as he did with Bogdan’s investigation and Kira’s inadvertent stakeout, we get the payoff by the end of the issue, forcing Dylan to confront the truth way sooner than we’re expecting. That quickened pace throws us off balance, managing to surprise us with a reveal, even though we basically already knew what it was revealing. That bottom image lends its sense of space to the entire page, opening up to give us not only a better view of the scene, but also to lead us to the next. It draws attention to that moment, while breaking it out of the rhythm of those around it, as if it’s somehow “realer” than the rest of the page. It’s a technique Phillips uses to pace most pages, almost like a punctuation mark. Phillips still opens with a fully bled image (whose colors mostly permeate the page), but ends with this odd panel that bleeds into the margins, but has hard borders separating it from the other panels. It gains some emphasis from being larger than the panels near it, but it doesn’t quite have the same effect. To my eye, the bleed makes it feel “realer” while the borders make it clear that it isn’t, effectively highlighting Dylan’s subjectivity. That is, this moment is important, but maybe only for him. Which leads me back to that final page. That page is a full bleed — as real as it gets — and seems to be the moment that Dylan finally faces the music on the nature of his “mission.” That we’re drawn into Dylan’s subjectivity just before that reveal is no coincidence, and again, goes a long way to selling a reveal we might have predicted in the first issue. There are countless ways I might have expected the story to get Dylan to this point, but this definitely wasn’t one of them. What do people think of the structure of this book? 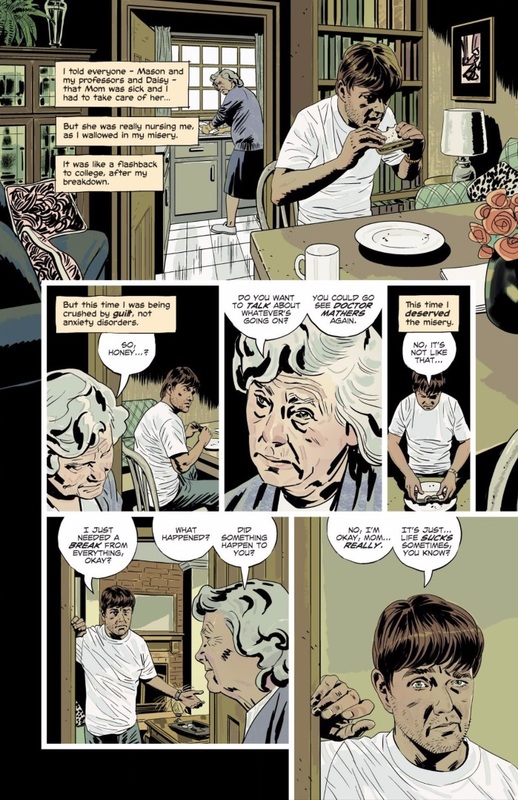 Because one thing I noticed as I reached the backmater was that Brubaker said this was the conclusion of the second arc, but does this book really have arcs? 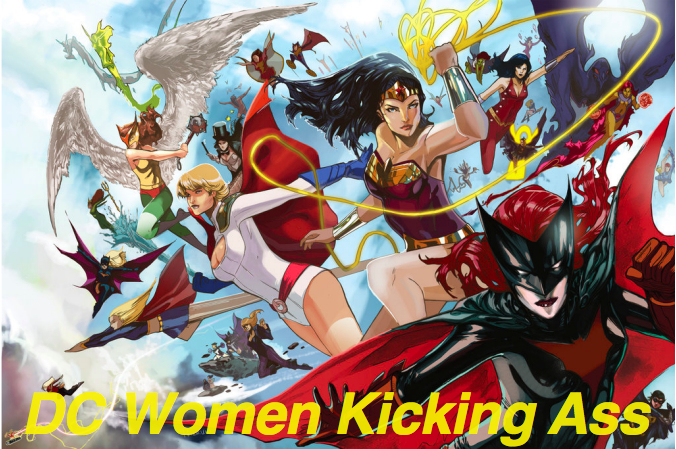 Each issue seems to be a self contained chapter, ending on a cliffhanger, and there is no reason why this issue in particular should be the end of the arc. There are, of course, some miniclimaxes, especially with regards to Kira. But just as many things that aren’t resolved to the respect you would say the end of an arc should be (like the cop, or the fact that retaliation from the Russians is such an idea). Honestly, I think this book resists the idea of arcs and easy collection in trades in a way that is pretty unique these days. THe only thing comparable would be Bendis’ current work on Spiderman (weird that the book that truly codified arc based storytelling back when it was Ultimate SPiderman, these days is the furtherest from it). But in truth, the structure is a throwback structure that has more in common with how comics were written before, the endless serial style where there were always a thousand thigns happening, and everything resolved at the right time, instead of all together in an arc finale. With both Brubaker and Bendis experimenting with a very modern approach to this classical structure, I wonder if we are going to see some sort of return to this sort of storytelling.